Lovely beachfront semi-detached duplex forming part of a family property, located right on the beach, facing the turquoise lagoon, well-protected by barrier reef (safe swimming & snorkelling even for children). Internet (Wi-Fi) available. Alfresco lunch/dinner on extended terrace (sitting 6), protected from the sun by bamboo stores. Renovated lounge/dining. New furniture & lighting fixtures. Wide 42' LCD screen on S/steel stand. Satellite TV (Fr/Eng/other channels). Open-plan kitchen with new equipment: fridge/freezer, microwave, gas/electric cooker, coffee-maker, toaster, kettle, washing machine. 1st floor: 3 air-conditioned bedrooms. Bedroom 2: Queen-size bed (1m60). Ceiling fan. Bedrooms 2 & 3 share a further bathroom (shower cubical) & WC. Maid service: 2hr daily, except Sundays & bank holidays. Cooking on extra. Bed linen changed twice weekly. Bath towels, hair dryer, safe, telephone, BBQ, TV with Satellite channels, Monitored electronic alarm. Well-stocked super-market 40 metres away. Several restaurants offering various cuisines (Chinese, Indian, European and local) at very moderate prices are at walking distances. A Pizzeria offering several Italian dish is just across the road. 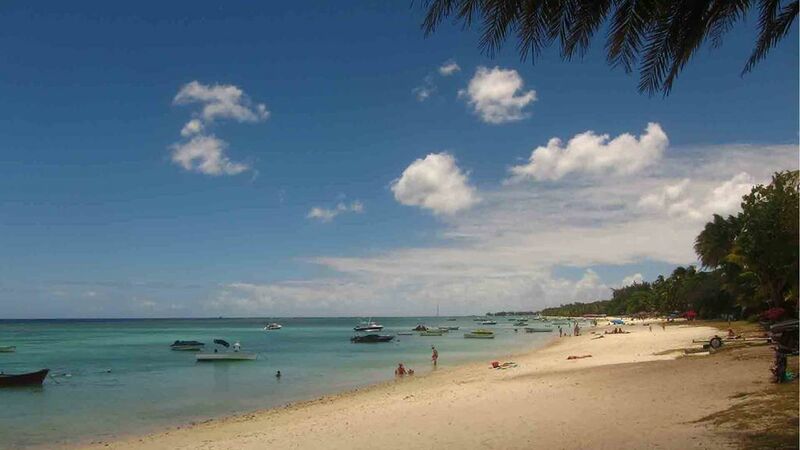 Location: Trou aux Biches, (north-west coast of Mauritius, is one of the most sought-after beach of the island, especially for its wide beach of powdery white sand and its safe lagoon, well protected by the barrier reef, for swimming, snorkelling and other nautical sports. Other nautical activities: Para-sailing, towed buoys, water skying, deep-sea fishing, scuba diving. All amenities available nearby: supermarket, pharmacy, pizzeria, boutiques, ATM’s. Bus-stops (in both directions) are only 15m from the villa. Immediate surroundings: A few bars in the area Walking distances). Grand Bay, 3 Km away, with its gastronomic restaurants, bars and night-clubs, open till early morning. Club-Med (2 Km away) offers regular night entertainment. Visitors on holidays are always welcome and may enjoy entertainment, bar and restaurant facilities at moderate prices. A large variety of fish can be viewed at the new Aquarium in Pointe aux Piments - the most popular visiting time being when the sharks are being fed. Our dad purchased a plot of land, along the beach in Trou aux Biches, and built a small family bungalow where, when we were kids, my brothers and sisters and myself used to spend all our school holidays. A cyclone in 1960 brought the bungalow down, and our dad rebuilt one in concrete. When he passed away in the eighties, we were 2 brothers and 4 sisters, all adults, and we build 6 units (one for each of us), and since then, each of us has been upgrading his specific unit. The property today includes a large house having 4 separate apartments (2 x ground-floor & 2 x first-floor apartments and a separate building comprising 2 identical 3-bedroom duplexes. Cyrano is one of them. I am a chemical engineer specialised in sugar manufacture. I studied in Australia, and worked a few years in Chad in charge of a sugar cane factory. I also introduced video games in Mauritius in 1980. My wife passed away in 2009, and now I live with a partner in Trou aux Biches, about 150m from our family property. I welcome personally all guests who book Cyrano for holidays. Cyrano is located in the family garden, right on the beach. I have always been around enjoying our small paradise since I was a kid spending our holidays with my siblings since 1950. I have tried to keep that friendly atmosphere, and every year, I have the pleasure to meet several repeaters who come back to our place every year or every 2 years. They are now my friends... not just repeaters. My pleasure is to greet new people as well to my holiday house enlarging my group of friends. Trou aux Biches beach is known as the most sought-after beach of the island. It is a small quaint village where everyone knows everybody. Operators of most nautical activities offer their service, picking our guests right in front of our property. The en suite bathroom has a washbasin and a mirror. Hot water (gas heater) in the cabin shower. The other bathroom also has a washbasin. Hot water (electric heater) in the cabin shower. An additional guest toilet with washbasin on ground floor. All 3 bedrooms have ceiling fans and are air-conditioned. Ceiling fans also in kitchen, lounge and terrace. Linens are changed twice weekly. The maid will operate the washing machine. Space for 1 car in the secure Parking area. Towels are changed twice weekly. New equipment in kitchen including Large Fridge-freezer, Cooker with 3 Gas Hob and 1 Electric Plate & Oven Microwave Oven. We would appreciate that guests do not smoke in the bedrooms. Ceiling fan in the lounge and terrace. The residents may use the kayak, provided the parents accept the responsibility for its use (not to leave it on the beach, and keep it close to the terrace when not in use. We are registered with Canal Satellite. Games available: Card & Domino games. Our house is fitted with a monitored electronic alarm system with immediate response. Wonderful location, quiet and neighbors were very helpful. Layout of lounge, kitchen, patio on ground floor is ideal. Beds are comfortable, and the AC was perfect, though only really need at night. The maid, Veena, was a delight, and can also prepare local meals for you. Having a good grocery store next door is hugely helpful! The beach has a lot of coral on it, but it's also quiet with some of the best snorkeling Mauritius. Sylvie and Yvan have been staying on 3 occasions at Cyrano. They are nice people who enjoy the prime position of Cyrano on the beach. When they leave, Cyrano is always as clean as when they checked in. It is always a pleasure to have them at our place. Public Transport (bus): well organized with an efficient network. Our accommodation, namely Cyrano, is located right on the beach in Trou aux Biches, 10 Km from Port Louis, 4 Km from Grand Bay where various night activities, restaurants, bars and night-clubs are found. Nautical activities available: deep sea fishing, scuba diving, underwater exploration by submarine, catamaran cruises to the northern islands, sailing boats, speed boats, kite-surf & parasailing. Safe snorkelling & swimming. Water skying & towed inflatable buoys operate right in front of the villa. Visits to the Aquarium 1.5 Km away in Pointe aux Piments, would gave a good idea of the various tropical fish the live in our waters. Flying trips on micro-light aircraft are available less than 1Km away, although the operator intends to move to Grand Gaube area (north-east of the island). Visiting the Botanical Garden in Pamplemousses is a must. Dating from the French Administration, before 1810, it spreads over 60 Acres, and is known to naturalists throughout the world for its wide collection of indigenous & exotic plants, including an interesting Spice Garden, the Giant Water Lilies and the Talipot Palm said to flower every 60 yrs after which they die. Other Activities: Parasailing, kite-surfing, submarine exploration, sub-aquatic scooters, catamaran trips, scuba diving, sailing. Golf: We have good contacts with all those who manage golf courses in Mauritius, which is becoming a true golf destinations. We offer facilities for cheaper green fees on most golf courses in Mauritius, including Four Seasons Golf Club at Anahita, Golf du Chateau in Bel Ombre, at Tamarina Golf Estate & Beach Club in Tamarin, at Links in Belle Mare or at Touessrok Golf Course at l'Ile aux Cerfs. We had problems in the past with people living locally visiting our clients in large numbers, and were very noisy, causing disturbance to other persons living close by. We strongly discourage such visits. Any client must obtain permission from us before receiving visits from people living locally.